Item Number: 810-S1506 18366 Actual Weight: 0.7 lb. Organize and store padlocks in one convenient, central location. Made of heavy gauge steel with powder-coated finish to ensure long life. Includes labels in English, Spanish/English and French/English. 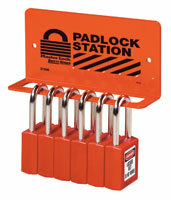 Choose from 6 or 18 padlock capacity. Padlocks sold separately.